There are plenty of books and articles written telling dog owners how to train their dog, but many take an one-size-fits-all approach in that they try to establish a time table of sorts - as far as what the pup should be taught at each age. That may be fine for some young dogs, but unless the owner or trainer is able to recognize the youngster’s readiness level and take into account his unique temperament, the training process will be stymied and efforts to push forward may actually be detrimental to the pup. Many good pups have been ruined by owners or trainers who are locked into the one-size-fits-all mentality and who are in a rush to have the young dog ready to hunt or compete. A bit of wisdom borrowed from experienced and successful trainers is that it’s far easier to avoid creating problems than it is to fix them. Like people, each puppy has it’s own personality and temperament. These traits begin to emerge around the time when the litter is weaned. Watching them at the food bowl, you (or your breeder) may notice a pup that prefers to avoid confrontation and will wait until its littermates have finished eating before stepping forward to eat. He is likely to be leery of drawing attention to himself for fear the bolder pups may clean his clock. This type of pup can end up being timid, cautious, laid back or have what is referred to as a "soft temperament". Often the soft pup is picked on by it’s littermates and when meeting new people or dogs, may appear cautious and not very out-going. That’s not to say it’s a bad thing, just that he is lacking in confidence. Once this pup becomes comfortable with the new dog or person or situation, he will gain confidence. Usually, this is a dog that will not challenge other dogs - or people - for dominance and can be an easy dog to train. It is common that these puppiess are slow to mature, meaning that they will be older before they are ready to be trained. But keep in mind that when corrected, a soft dog may shut down, his feelings can be hurt and he will likely hold a grudge. The key to working with a soft dog is patience: taking it slow, building up his confidence and being gentle. "A bit of wisdom borrowed from experienced and successful trainers is that it’s far easier to avoid creating problems than it is to fix them." The bold, independent pup usually seems quite confident from the start. Often, these are the pups who claim "top dog" status in their litters. Early signs that a particular pup may have this personality can be demonstrated as this pup exerts his dominance over his littermates at the food bowl by pushing less confident pups out while he eats his fill. During play, the "boss pup" will make his status clear to littermates by placing his head and neck over that of lesser ranking pups or "T-ing" them, sometimes biting them or knocking them down. The less dominant pup will usually be quickly willing to say "uncle" and you may notice that he carries his tail lower while the "boss" pup struts around with his held high. 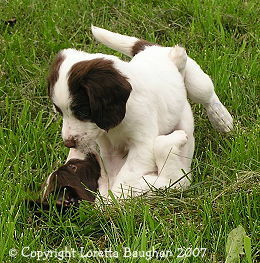 As puppies within the litter gain more confidence, you will sometimes see pups challenging the "boss" pup. Usually, by the time the puppies are eight weeks old, the question of which pup is "top dog" has been settled. This personality type may be best-suited as potential field trial dogs since they are often ready to train at a younger age and will take correction in stride. In a family situation, this is a pup who will try to challenge the authority of people. Unless the owners are able to be 100% diligent in establishing and maintaining their position of "boss", this dog may not be a good choice. Typically, once I identify the pup with this personality, I will only place him with a field trialer or an experienced trainer as this is the best situation for the dog - as well as the people involved. This is undoubtedly the best reason for not allowing puppy selections to occur before personalities are evident and most definitely why puppies should not be chosen based on their looks or markings. Many experienced breeders realize this and will select puppies for their buyers based on suitability of temperament. Training the bold pup, one can often forget it is still just a puppy, so the temptation to train it too fast needs to be controlled. However, not all of these young dogs are ready for field work from the get-go. Even among the pups with this personality type, you will find some that I consider to be "late bloomers" as far as field readiness goes. This pup may be more interested in discovering scent, exploring cover or just getting out to run than in showing an early interest in retrieving or even in birds. Some people may advocate table training or "force fetch" in order to get them in the field and ready to train at a younger age, but personally, I prefer to take the patient approach and let the late bloomer bloom at his own time. "Before a pup or new dog can be expected to retrieve, he must first trust and respect the owner or trainer." These are the two extremes in temperaments. The majority of puppies will fall somewhere in between on the scale of bold to soft temperaments. As such, they are well-suited to most homes and are better suited to most novice trainers. If the owner or trainer understands the common traits for the soft and bold pups, they should be able to identify each type of trait in the in between individuals. When a new pup - or even an older dog - is brought home, it is important to resist the urge to get it started on a training regiment right away. Instead, give it plenty of time to adjust to his new surroundings and family. Enjoy the dog, get to know each other and concentrate on bonding with him. This is extremely important because you need to gain his trust if you want a dog that will desire to please you and work well with you as a team - whether that is competing in field trials, hunt tests or other venues. Developing that bond and trust first is key in enabling your new dog to become a good hunting partner and a great family dog. Trust is number one. During this process, your dog will begin to feel secure in his surroundings and he will build confidence along with a desire to please his new best friend. Pay attention to how he reacts to new situations, every day activities and differences in your tone of voice. Once the pup’s temperament has been observed, identified, and understood, training can begin. There seems to be an urgency to get a young dog retrieving - as soon as possible. Before a pup or new dog can be expected to retrieve, he must first trust and respect the owner or trainer. Start by getting the youngster to feel comfortable coming to you. I like to take me young dog for walks in the field behind the house. Getting them away from familiar surroundings minimizes distractions. 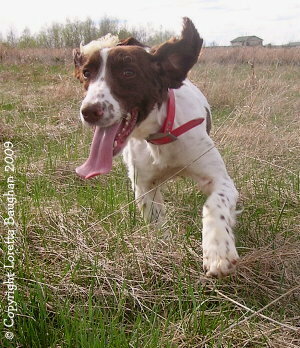 Walking out to the field gives the young dog a chance to burn off a bit of energy, taking the edge off his excitement. I keep it fun by smiling and not issuing commands. In fact, I say very little. Talking too much puts the pup at risk for developing the habit of tuning it’s owner out. As we walk in the field, I will find a spot to sit and just let pup sniff around and enjoy himself. Sometimes, I bring along the camera and enjoy snapping photos of him. You can get some great shots from ground level. When I sit on the ground, some young dogs will run right over, get in my lap and want to be hugged. Great! These pups already trusts me. On the other hand, the less confident or soft pup may come close, but rather than coming to me for attention, will hesitantly circle and may lay down in the grass, at a little distance... just watching me... and sizing me up. Resist the urge to grab the pup as he comes close. Instead, give him the time he needs to build trust. Understand that he wants to come to you, but does not yet have the confidence to do so. Some people may try to bribe the dog in with treats, but a better route is to have patience. Treats may get the dog to come in, but will not enable him to develop confidence. The youngster needs to feel comfortable and confident enough to trust you in order come to you all on his own accord. If you try to force it, there will always be a seed of doubt in the dog’s mind which will likely manifest itself as retrieving problems. Remember, there is no rush. Like fine wine... it may take some time. When you are on a walk and sitting in the grass, avoid direct eye contact with the soft dog as this can be intimidating for some. Try ignoring the pup. Lay down in the grass to make yourself small and approachable. Make some kissing noises which can pique the pup’s interest, bringing him in to investigate. Before long, he will begin to feel comfortable and will come to you on his own. It may take a day or a week or maybe a month. Be patient. Beginning to retrieve with a young dog that does not yet trust the owner or trainer - and is lacking in self-confidence - will only compound the situation and cause problems. If retrieving is pushed too soon, they tend to react by either ignoring the tossed dummy (or ball or other object) or, if they pick it up, will not bring it to you. In many instances, it may not be that the youngster who refuses to bring the retrieve in is actually possessive, but instead, he does not have the necessary confidence and trust. For some pups, retrieving is second nature - like eating or breathing. Bear in mind, though, that the surest way to mess up a puppy is to over-do the retrieving which will result in boredom and ultimately, a refusal to retrieve. If a young pup enjoys retrieving, limit retrieving to no more than three tosses, a couple of days a week. Keep him begging for more. "In many instances, it may not be that the youngster who refuses to bring the retrieve in is actually possessive, but instead, he does not have the necessary confidence and trust." If you have a reluctant retriever, never try to grab him as he comes near to force him to bring you the retrieve. If you do, next time, he will be sure to stay farther away. Some writers advocate retrieving with a young pup in a hallway so he can’t try avoidance. In my experience, I found that a hallway may work for the first retrieve, but the pup is usually smart enough by the second toss to pick it up then lay down and play with it instead of bringing it back to me. So nothing is gained and the foundation for retrieving problems has been laid. If the owner tries to force the young dog to retrieve, it will become a battle of wills. In the pup’s eyes, the determined owner is viewed as an angry old cuss and training becomes "no fun". This approach is futile. 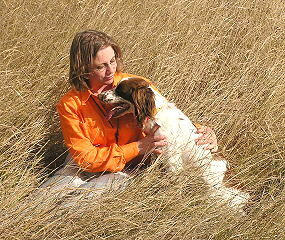 Perhaps the best advice on starting to retrieve with a young dog is to relax, don’t expect perfection and not to worry. It doesn’t matter if your pup does not retrieve at as young an age as someone else’s pup. He may just be a late bloomer. With some patience and time, his natural desire will awaken and he may just surprise you when you least expect it. The bold, independent type of young dog needs to be reminded who’s boss in the field. Taking a walk, he’s likely to try to set the agenda. Don’t let him dictate which direction to walk or you’ll find yourself becoming a follower as he relishes his role as the leader. He needs to learn that he is working for you. So, on a walk, remain silent as he stops to sniff the weeds, and without warning change the direction you are walking, keeping your pace and not looking back. No matter how bold and independent he may seem, he really doesn’t want to be left behind and will quickly decide to catch up! Repeat, as needed, and before long you will notice him keeping an eye on you as he responds to your direction. About this time, I usually start indicating my desire for him to change direction with a simple extension of my hand to one side or the other. By knowing your young dog's temperament type, learning to read him and having some patience, you can avoid many of the pitfalls of dog training. Once you have built trust with your dog, he's become self-confident and will come to you with enthusiasm, you'll know he's ready to begin retrieving.